DIE Sabbati, 26 die Januarii. Ld. Willoughby takes his Seat. Witnesses concerning it to be examined. Committee to search Precedents, concerning Trials of Peers for Misdemeanors. Royal Highness the Duke of Yorke. The Earl of Bridgwater reported, "That the Committee have considered of the Bill for selling of a Messuage in Cheswick, for Payment of the Debts of Edward Russell Esquire; and it appeared to the Committee, that the passing of this Bill will be much Advantage to the Estate of the Heir: Therefore the Committee are of Opinion that this Bill is fit to pass as it is, without any Amendments." Hodie 3a vice lecta est Billa, "An Act for selling a Messuage in Chiswick, for Payment of the Debts of Edward Russell Esquire." Hodie 2a vice lecta est Billa, "An Act for granting the Sum of Twelve Hundred Fifty-six Thousand Three Hundred Forty-seven Pounds, Thirteen Shillings, to the King's Majesty, towards the Maintenance of the present War." ORDERED, That the Consideration of this Bill is committed to a Committee of the whole House. To this Purpose, the House was presently adjourned into a Committee. The Earl of Bridgwater reported, "That the Committee of the whole House have considered of the Bill of Assessment; and return it as fit to pass, without any Amendments or Alterations." ORDERED, That this Bill shall be read the Third Time on Monday Morning next, the First Business. Memorandum, That this Day William Lord Willoughby of Parham presented his Writ of Summons for his sitting in Parliament, upon Descent, after the Death of his Brother Francis Lord Willoughby; and accordingly took his due Place. "1st, That the Goods in Question were the proper Goods of Englishmen, and no Part belonging to any of His Majesty's Enemies. "2dly, That the said Goods were the Product of English Commodities, and native Growth, and not for Money sent out of England for them. "3dly, That the said Goods were the first of them laden the 24th of October last, Stilo Novo; and the last the 30th of November, Stilo Novo. "Lastly, That divers Persons were ready, to the Number of Twenty and upwards, to have been examined, and have given the same Satisfaction to their Lordships as the others did; but, by reason their Lordships conceived themselves bound up by the Order of this House, not to examine any more than were in the said Order, they could not proceed with them as they did with the other; but they being a Part of the List wherein the Ladings and Goods of others were mentioned, and a more considerable one, as being the better Half, their Lordships did conceive them fit Objects of their Commiseration as well as the other, because that they had only the Misfortune of coming too late to be sworn with the rest, not any Ways through their own Default." Hereupon this House ORDERED, That these Persons should be sworn at this Bar, and be examined by the said Committee as the former Merchants were Yesterday, to the same Intents, and upon the same Grounds; and the Committee is to meet this Afternoon, at Four of the Clock. Robert Bendish, for himself and Abraham Castle and Company. Nicholas Hayward, on Behalf of John Wadlowe. Thomas Seaward. 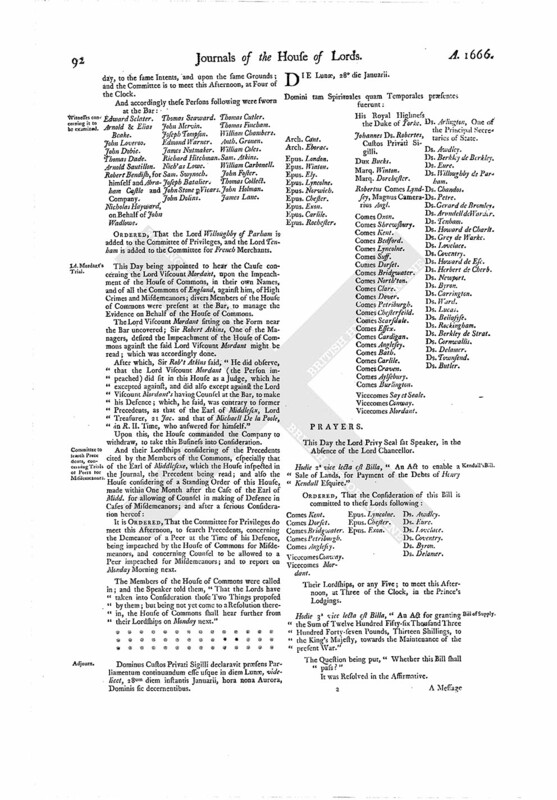 ORDERED, That the Lord Willoughby of Parham is added to the Committee of Privileges, and the Lord Tenham is added to the Committee for French Merchants. This Day being appointed to hear the Cause concerning the Lord Viscount Mordant, upon the Impeachment of the House of Commons, in their own Names, and of all the Commons of England, against him, of High Crimes and Misdemeanors; divers Members of the House of Commons were present at the Bar, to manage the Evidence on Behalf of the House of Commons. The Lord Viscount Mordant sitting on the Form near the Bar uncovered; Sir Robert Atkins, One of the Managers, desired the Impeachment of the House of Commons against the said Lord Viscount Mordant might be read; which was accordingly done. After which, Sir Rob't Atkins said, "He did observe, that the Lord Viscount Mordant (the Person impeached) did sit in this House as a Judge, which he excepted against, and did also except against the Lord Viscount Mordant's having Counsel at the Bar, to make his Defence; which, he said, was contrary to former Precedents, as that of the Earl of Middlesex, Lord Treasurer, 21 Jac. and that of Michaell De la Poole, in R. II. Time, who answered for himself." Upon this, the House commanded the Company to withdraw, to take this Business into Consideration. 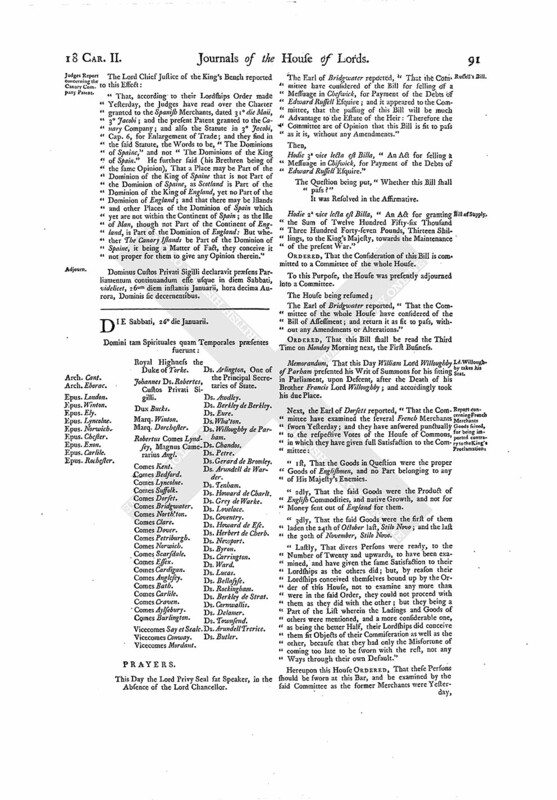 It is ORDERED, That the Committee for Privileges do meet this Afternoon, to search Precedents, concerning the Demeanor of a Peer at the Time of his Defence, being impeached by the House of Commons for Misdemeanors, and concerning Counsel to be allowed to a Peer impeached for Misdemeanors; and to report on Monday Morning next. The Members of the House of Commons were called in; and the Speaker told them, "That the Lords have taken into Consideration those Two Things proposed by them; but being not yet come to a Resolution therein, the House of Commons shall hear further from their Lordships on Monday next." Dominus Custos Privati Sigilli declaravit præsens Parliamentum continuandum esse usque in diem Lunæ, videlicet, 28um diem instantis Januarii, hora nona Aurora, Dominis sic decernentibus.